Today i wanted to talk to you all about a fairly new treatment for scoliosis patients, called spinal tethering surgery. Spinal tethering surgery, is a less invasive alternative to spinal fusion. Just like spinal fusion and all other surgeries, tethering still has risks/ advantages and disadvantages towards the procedure, for example tethering reduces the amount of blood a patient may loose whilst in theatre and has a shorter recovery time post surgery. Spinal tethering does not leave you with a long scar down your back from the incision, instead it leaves you with a 4-6 inch scar under one of the armpits as it is performed endoscopically. Spinal tethering can be preformed at younger ages in order to help guide the spine through growth, whereas patients usually have to wait until fully grown to have a spinal fusion. One disadvantage towards spinal tethering, is that it has only just been introduced in the last 7years, meaning that it has not been practiced as much as the fusion method. Whilst tethering allows a patient to be able to keep as much flexibility as possible, it is not an imidiate fix to the problem. The surgery involves inserting screws into the vertebrae affected by scoliosis. The surgeon attaches a cord to each of the screws and then pulls and secures the cord, so the vertebrae are cinched together on one side and splayed open on the other, correcting the curve. This aligns the spine and gives the vertebrae space to grow in properly. Spinal tethering was designed to treat patients with moderate - severe scoliosis. Tethering, allows scoliosis patients to continue growth. 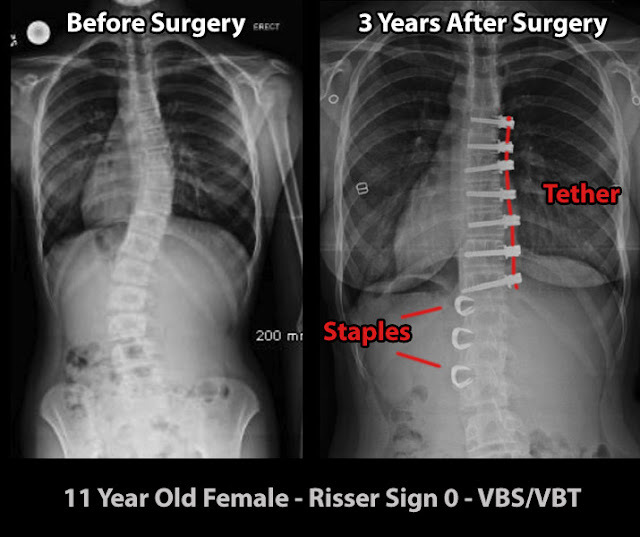 spinal tethering surgery, is perfect for those with moderate to severe scoliosis, but whom still have a significant amount of growth left. Although I had spinal fusion surgery, I still think that spinal tethering or (VBT), is a good solution for those whom still want to keep as much flexibility as possible. In my opinion, If your scoliosis is very severe (70 degrees or over), I would still go with fusion surgery as it is could give you a closer correction. I think that the fact that scoliosis patients now have a choice of which surgery they want, is amazing and it really shows how much scoliosis research has improved. Both surgery's are highly successful and I'm sure which ever you choose, will give you an amazing outcome. I really hope you have enjoyed reading this blogpost, and that you found it useful. Please feel free to leave a comment regarding scoliosis and I will reply as soon as possible.